Dieffenbachia often called ‘dumb cane’ is used widely as a foliage plant. A rather hardy but slow growing plant it does make an excellent indoor plant. D.maculata is a popular species that has been widely hybridized with attractive green and gold foliage make it suitable for many locations. 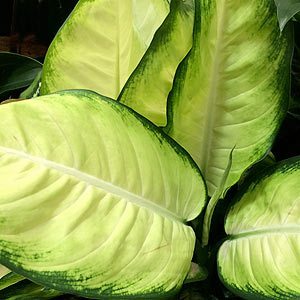 Dieffenbachia seguine has more variegation to the foliage than some species and is originally from Mexico and Brazil. Over time most species will reach around 1m in height, however we have seen them a 2m. Old foliage can be snipped away to maintain an attractive appearance. The sap can be an irritant so handle with gloves on. The plant gets a bit of a bad wrap as being poisonous, and indeed it you eat it is is. However it is more likely to make you sick first. So yes they are poisonous to dogs and cats (and humans), however not many dogs and cats will eat them, even our Labrador. Best positioned away from children and pets. These are a tropical to sub tropical plant and Dieffenbachia require warm conditions and a moist soil, allow to almost dry out between wateringd. A little extra humidity can help in dry indoor conditions as well, so sit the plant above (not in) a saucer of water. Good filtered light and a regular application of general purpose slow release fertilizer during the periods of active growth and they are easy care. Keep away from cold drafts. Water during the growing season – less in autumn to winter. Te foliage can be cleaned with a lukewarm water to remove dust. Plants that have dropped foliage at lower levels can look a little tatty, these can be cut back to around 8 – 12cm and they will reshoot. Soil – Humus rich, free draining and moist. Height – Can reach nearly 2 metres (6ft) over time, generally half this height. Watering – Allow the soil to dry partially between waterings. Fertiliser – A general purpose slow release fertiliser in spring is adequate. Propagation – from stem cuttings.